You are currently browsing articles tagged hair-cutting ceremony. God it’s hot. Like 90 degrees. And probably 125 percent humidity. Or at least it feels that way. I’ve never had curly hair in my life. But I do today. Wet ringlets from the sweat that seems to ooze out of the top of my head. But I shouldn’t complain. 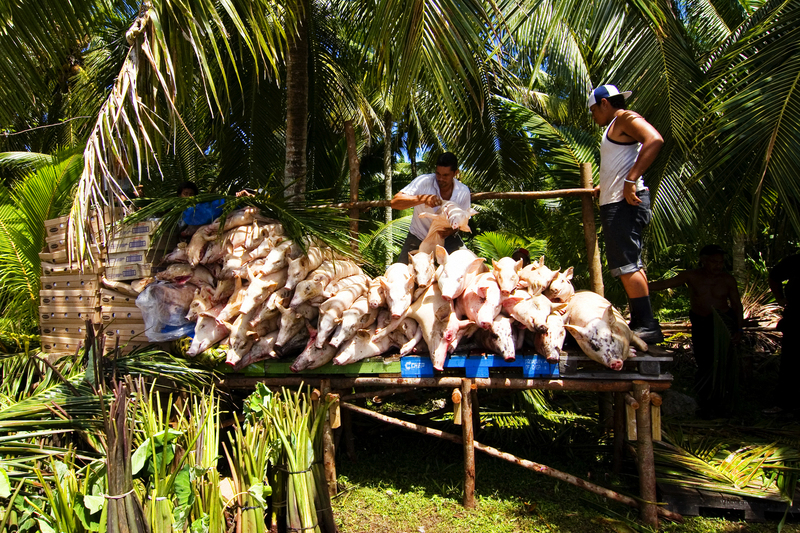 I don’t have it near as bad as the little 8- or 9-year-old boy sitting atop boxes and boxes of chickens on a truck parked beneath a coconut tree (I guess the driver of the truck doesn’t know about Niue’s Rule Six). Each box holds six whole chickens and there must be at least 40 boxes. I’m not sure if he’s sitting on the boxes to wave away the flies or to keep people from walking away with the chickens (on second thought, it can’t be to keep the flies off since there are too many of them and the kid seems totally oblivious to their presence). Actually, it’s not the boxes of chickens sitting out in the fierce noon day sun (sans ice) that bothers me as much as the 50 or so dead pigs piled on a cart beside the chickens. Is it a good thing for dead porkers, blood caking their slit throats, to age in heat that would curdle a glass of milk in five minutes? The chickens and pigs, along with bundles of taro and giant clumps of sweet finger bananas, are gifts for the villagers here to celebrate the hair-cutting ceremony for Marc Teliga. Traditionally, Niuean boys do not cut their hair until they become teenagers. Then there’s a big party, organized by all the sisters and mothers and aunties in the village, and everyone comes to watch some grandfatherly-figure chop off the boy’s locks. Just about everyone in the village is invited to the party and there’s punch and taro cooked five or six different ways (I like the taro casserole with rings of pineapple on top) and a couple of guys strumming guitars. As part of the deal, the guests bring envelopes stuffed with money and, depending on how much they give as well as their station in life on the island, they get to take home a pig (if they made a sizeable donation) or a chicken (not as much cash) or some bananas (if it was just a token amount). 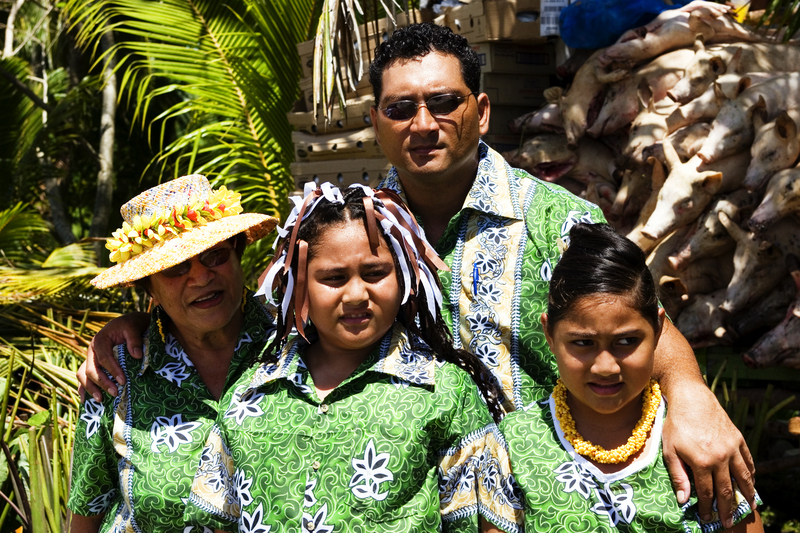 According to Ida, it’s all part of the Niuean culture—a way to link families of the village together and also a way for the community to look after its own. So how much would I need to donate, I ask Ida, to take home a pig? She shrugs. “Maybe one hundred dollars,” she says. So I slip a twenty in an envelope and give it to one of the family members. They smile, shake my hand with great enthusiasm, and then give me one of the warm chickens the boy has been sitting on all day. “Oh, how absolutely lovely,” I say. And then Ida and I make our exit. When I drop her off back in Alofi, I hand her the sun-baked chicken. “You don’t want it?” she says. That night the Matavai has a barbecue on the deck. Barbecued ribs, roasted chicken, skewers of curried gizzards. For some reason a salad sounds really good to me.